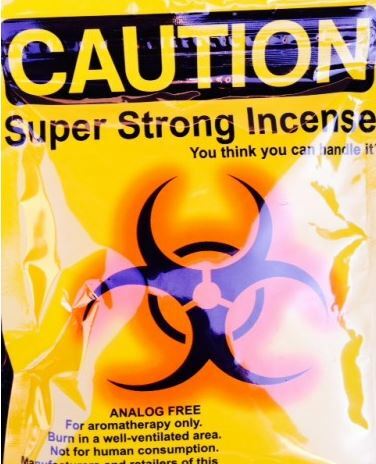 The first thing I noticed was how the package was labeled with a “Super Strong Incense “. This led me to inspect the packaging further. The package has a larger ‘Caution’ logo on top of the pack. The quality will seem to be potent. The first step in playing detective was the quick sniff test. Opening the package it smelled of stronger lemon smell. The herbs themselves seemed different with the authentic containing green and mildly moist herbs. Now it’s been a long time since I have burnt the potent herbs. The true test comes when noting the effects of burning the Caution Yellow. Other than a hint of harshness, it burns like a charm and brings me close to the days of first experience of having stronger blends. The aroma is very strong and matched by its impressive potency. After burning one feels a very intense vibe throughout the body, followed by mild numbness and relaxation. This was truly a brilliant smoke, which was sent free from Expresshighs.com. I’d like to write a review but not sure if this is the right section, but the leaf structure was pretty unique, the smell reminded me of a mild spice but with a hint of something else, not sure how to describe it. The packaging was nice and tight, it clicks to close the packet which keeps it fresh. The high comes in 2 minutes and does last a decent while, but as it comes off so smooth its hard to describe when this happens, say 40 mins or even more if you make it stronger. towards the bottom you will come into some twigs but thats nothing compared to the strength and the high. The high itself is very strong, yet you can still be active and continue normal duties. For me, i get the giggles or i tend to listen to music more so than if not using it before. all in all, this is a great product, tastes decent and the high is what puts the smile on your face..worth every pound and if you’re a bong/pipe man, you’ll be even higher as caution yellow lives up to its name.